According to ChemOrbis, new July prices for European PS cargos started to emerge towards the end of this week with recent offers indicating €60-80/ton reductions month over month. 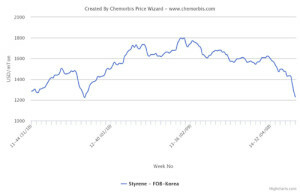 Players in the region were not surprised hearing lower PS offers as styrene monomer contracts were settled down €85/ton earlier this week amidst expectations for drops between €60-100/ton. In Italy, June PS transactions were wrapped up with rollovers to slight discounts recently while distributors reported seeing limited buying interest for their materials for the most part. Buyers elected to remain on the sidelines with purchases at a bare minimum out of their anticipations of seeing a downturn by July. A disposables converter in Italy stated, “We closed our purchases with €30/ton drops for June and we believe more drops will pass in July. We expect to see some seasonal improvement in our end business.” In Germany, a packaging converter had not made fresh inquiries as he believes that the prevailing prices may be adjusted down further in the latter part of the month considering the larger drop in styrene monomer contracts. “Our suppliers of South European and Central European PS are yet to determine their fresh offers so far whereas we received €65/ton drops from our West European source. Prices may fall this month to match the entire styrene contract decrease, we heard. Local stocks seem low in Europe, meanwhile, given limited imports to the region,” a buyer commented. In nearby Turkey, fresh offers for a West European PS origin were revealed with €50/ton decreases when compared to the last June deals for notable tonnages, according to ChemOrbis. However, the recent levels represented larger reductions of €110-130/ton from early June. An agent of the supplier opined, “We hope to see better demand after our price cuts. Some companies delayed their decreases to August hoping that prices may not fall that much during July and that they can hold their price levels to some extent during the summer holidays in Europe.” He further commented that if spot styrene retreats in the region, there might be some additional discounts from initial July levels later this month. July styrene contracts settled with a decrease of €85/ton ($94/ton) from June at €1325/ton ($1472/ton) FOB NWE on Wednesday. 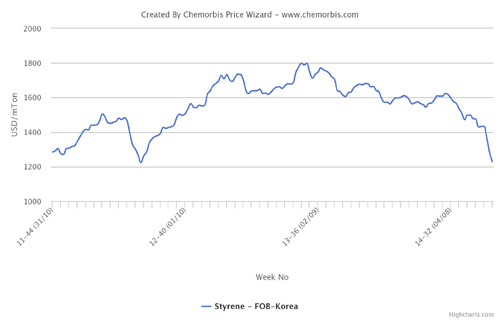 For spot costs, styrene prices fell by around $120/ton in a month on FOB NWE basis.